Are you tired of the usual turkey and trifle, gingerbread and ham… and that drunk uncle who slobbers all over the food? Christmas is not always how we imagine it to be. It can be the same boring party, year in and year out. Great news for you! A Christmas casino theme party takes your usual get-together and levels it up, big time! We’re talking about a casino party that’s so awesome, even Santa would want to crash in/cash in on the fun. A casino theme does not mean you have to let go of beloved traditions. Santa and his elves can still join in…this may just mean that instead of making toys, they play Poker and Craps! Or you may find them at a Roulette, Blackjack, Baccarat, Sic Bo or Money Wheel table, where the Croupiers may be dressed in the traditional vest and tie, or they might be in full Christmas fancy dress – the choice is yours. Maybe you’d like to deck the tables in green and red, with tinsel, baubles and playful lights. It will feel as Christmas-y as you want your party to be! This goes for the food too. Because your guests might be busy playing games, it’s a good idea to reimagine Christmas dinner as bite-size canapes. As one hand throws the dice, the other holds a delicious mini turkey sandwich. Let your creativity take over the kitchen. Or, if you’re not a chef-wanabe, let a real one cater your Christmas Casino party. And don’t forget the champagne. What’s Christmas without bubblies to toast family and friends? Raise your glass because your party is sure to be unforgettable! 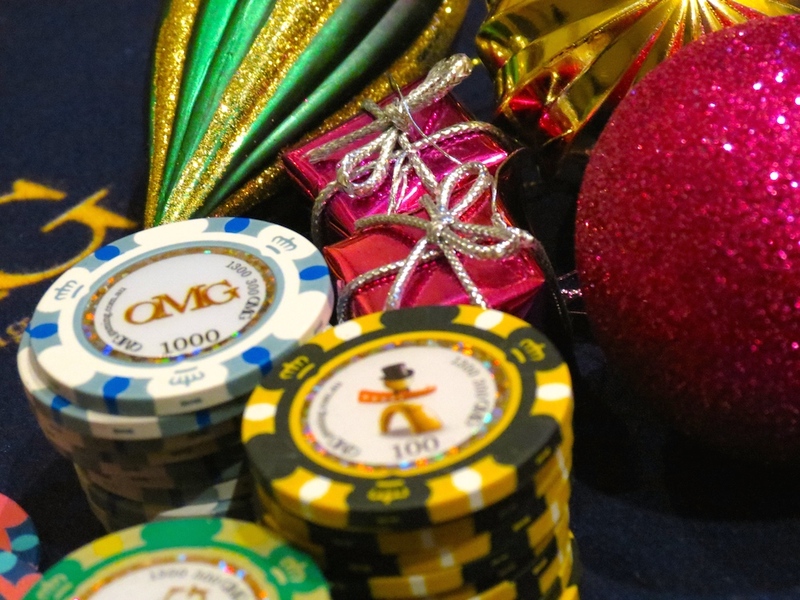 A casino theme for your Christmas party might be something new. But, it’s a good kind of “new.” First of all, you inject a whole new level of fun and excitement to the usual party. Playing games of chance, bluffing and winning millions of fake casino money can do that. You also create a year’s worth of funny stories and good-hearted teasing. Your guests will remember how you have such a glaring tell while playing poker. They will tease your best friend about folding too often, even with a good set of cards. They will remember the thrill of winning thousands on the Money Wheel. Like kids who just opened their Christmas present from Santa, your guests will be wild with excitement! Who Wants a Silent Night Anyway? Christmas parties should be rollicking good times! Make sure you hire the best casino tables and the most entertaining Croupiers for your Christmas Casino theme party. OMG Gaming & Entertainment services Sydney, Wollongong, Newcastle, Central Coast, Brisbane and the Gold Coast. OMG provides Casino tables and Croupiers for Roulette, Baccarat, Blackjack, Poker, Craps, Sic Bo and Money Wheel. They’ll make sure your guests feel like all their Christmases have come at once! Find more Casino theme party ideas. A Casino theme…or a themed Casino?